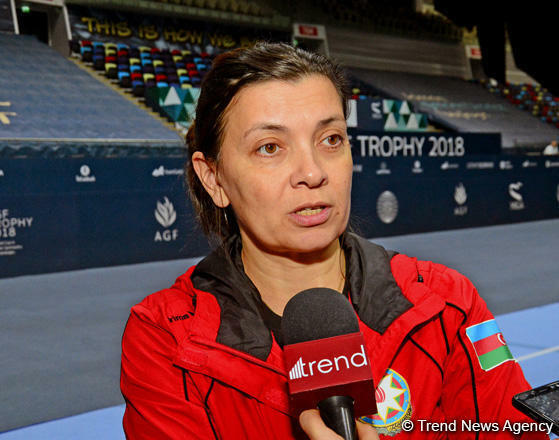 Azerbaijani athletes are well prepared for the upcoming FIG Acrobatic Gymnastics World Cup in Baku, head coach of the Azerbaijani national team in acrobatic gymnastics Irada Gurbanova told Trend. She noted that the main rivals of the Azerbaijani gymnasts at the upcoming World Cup are athletes from Belarus, Russia and Kazakhstan. “But we will make a serious competition,” she added. Gurbanova stressed that great attention is paid to the development of sports in Azerbaijan. For the first time in Baku, the FIG Acrobatic Gymnastics World Cup will be held in the National Gymnastics Arena on November 17-18. Silver medalists of the World Age Group Competitions (2016) - Seymur Jafarov and Murad Akparov will compete for the best places within the Men's Pair. The traditional “AGF Trophy” Cup will also be presented to Pairs and Groups having received the highest scores at the events.